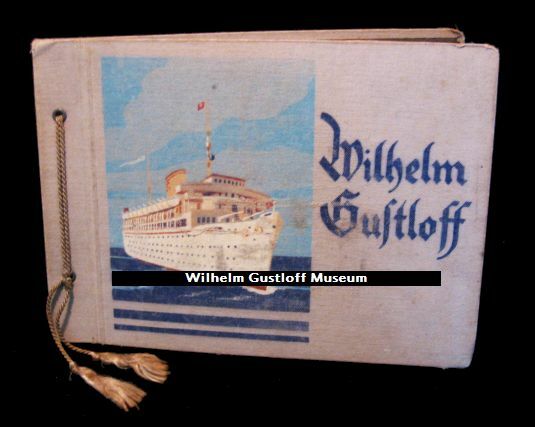 The unfortunate thing about the Wilhelm Gustloff's voyages is that there is no concrete listing of all 50 trips. Over the course of 3 years, I have compiled what is probably the most complete listing - a full 10 pages - of her trips and dates. 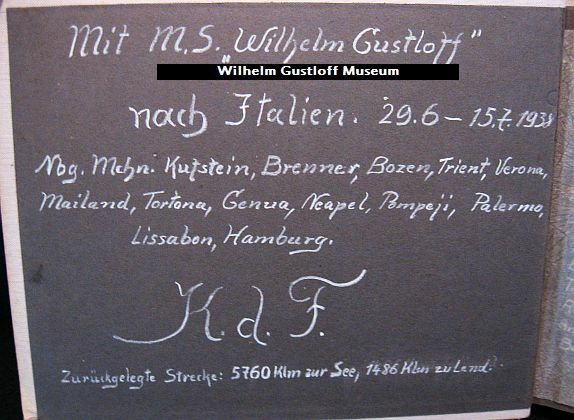 As the list stands now - the Gustloff had 358 different Speisekarten over her career, and that's not including the voyages that are missing. It was finally discovered this album is from Voyage #7 since obtaining the set of menus from the same trip. 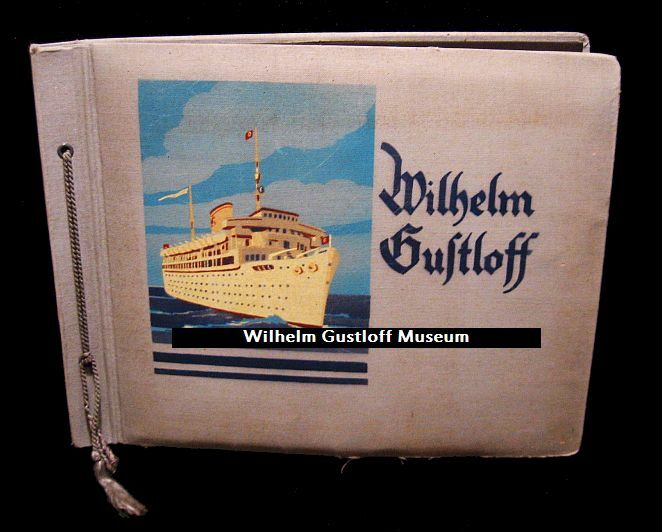 This album has several interesting photos of the Gustloff, including photos of the U-28 at sea and along side the liner. This u-boat would later sink at pier due to a mechanical failure. Dr. Ley is also playing shuffleboard on the ship. The other nice thing about this album is the author wrote captions to go with every photograph. Another Norwegian Fjord photo album that begins in Hamburg, takes you through the fjords, and back to Hamburg again. 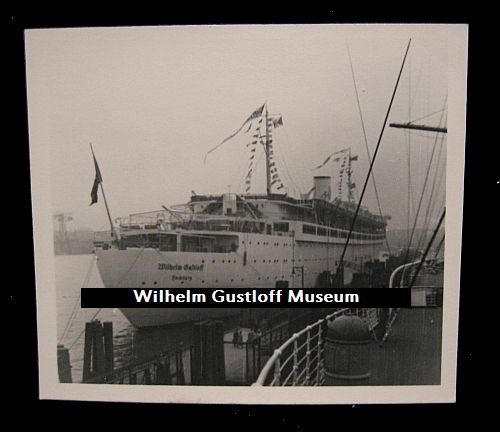 This album has one of my favorite images of the Gustloff as she's returning to Hamburg - at far right. Every photograph has a caption written on the back explaining the photo as well. Exercising on deck and passengers playing games are big parts of these voyages as evidenced by these next two albums. The end of this album has a few photos of a trip to a zoo, which have been left out of the thumbnail selection. 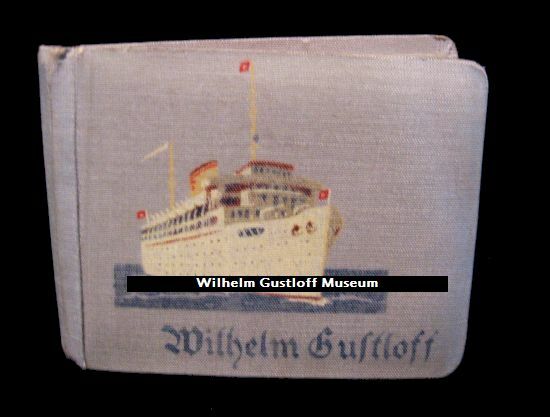 Passengers often photograph other Kraft Durch Freude liners, as in this album they pass the Der Deutsche. 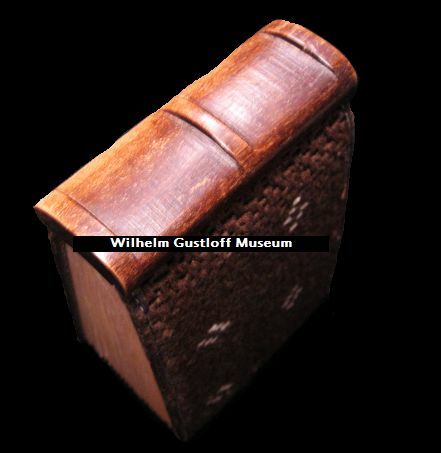 This brown album with wood binding comes from the same family as the blue album above. Captions are also written on the back of all 46 photos, which is how it is known what voyages these albums are from. 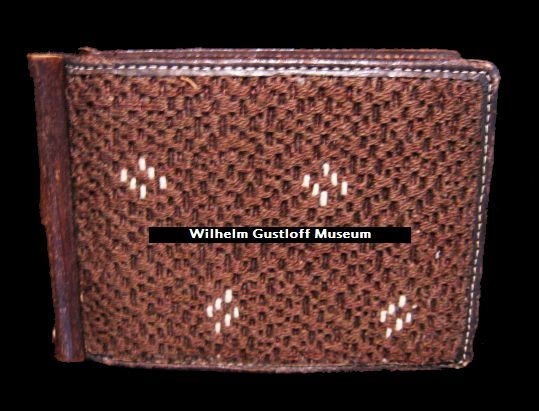 The majority of these photos focus on the land trips (and some very beautiful photos of Venice), but a section in the middle focuses on the games passengers are playing on the Gustloff's Sun Deck. Other photos show a band marching around the lower Promenade Deck and the last photo is the train at the end of the voyage. 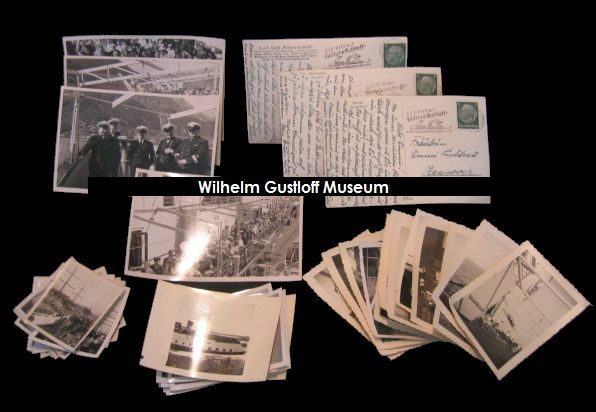 Seven 9.5" x 7" original builders photos from Blohm & Voss of the Wilhelm Gustloff's interiors. 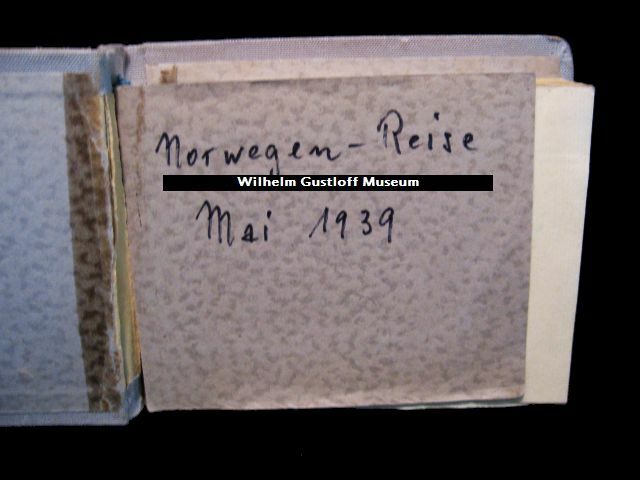 Also included in this collection is a 2 page report on the Gustloff's interior data. 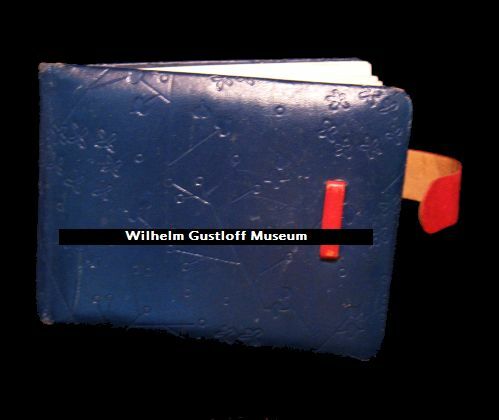 The two forms included are titled: "Data concerning the Wilhelm Gustloff." They include mainly measurement information for her major exterior parts, i.e. funnel specs, deckspace, lengths, heights, and weights. The second page is information on her public rooms and cabins, along with their measurements as well. 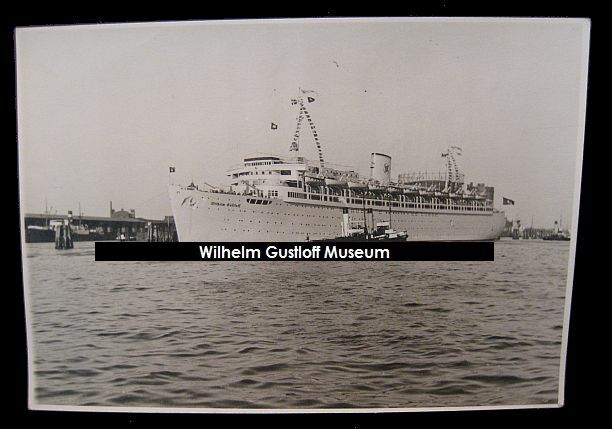 If you ever wanted to know how many toliets were onboard the Wilhelm Gustloff, the answer is 145. Her interior spaces were also designed by Woldemar Brinkmann, Bremen. 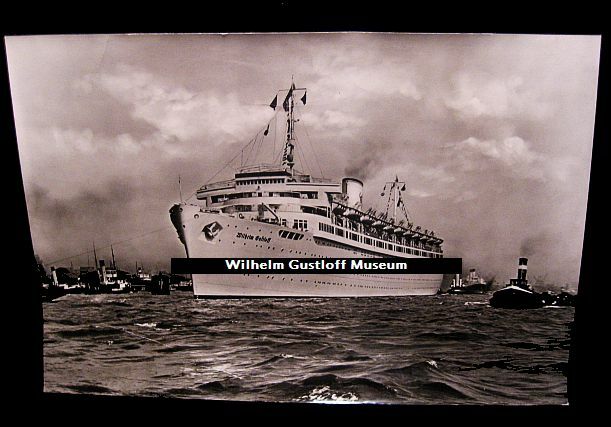 Photo #5 - A Wilhelm Gustloff parade float participating in the 5th KdF parade, Hamburg. July 23rd, 1939. 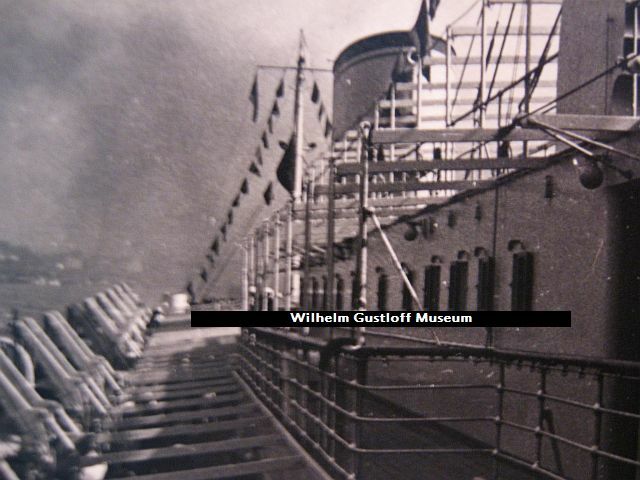 Photo #30 - ​​​Thea and captain on board the Wilhelm Gustloff. 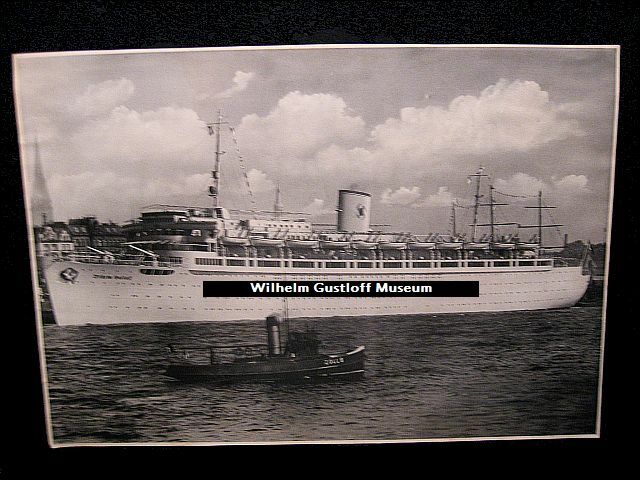 Photo #31 - The Wilhelm Gustloff with the Italian luxury liner S.S. Rex in Genoa, Italy. 1939. Photo #33 - ​​The German battleship Gneisenau in dry dock. Both measure 15" x 10"
Postcards and translations can be viewed under the Postcard Page. Left: Hitler Youth onboard the Wilhelm Gustloff. Did you know the BDM and HJ had their own accommodations on the ship? Cabins for 30 boys and 30 girls with a lounge and their own bathrooms. A set of six photographs from Italy with the Wilhelm Gustloff, Stuttgart, S.S. Rex, and a Savoia-Marchetti, -probably an S.66 model - taking off or landing by the Gustloff.